Read pages 461-463 in the Handbook of Nature Study (Lesson #117). Here is a very useful page with information about the hepatica including images of the different colors: US Forest Service. It also shows the range of the hepatica. Youtube videos: Liverleaf Hepatica and Sharp Lobed Hepatica. Advanced Study Video: Hepatica. Please note I do not endorse any medicinal uses noted in this video. Take an early spring nature walk looking for the first signs of spring and wildflowers. Hepatica will be found early in the season. Make note of the habitat where you find the hepatica blooming. This is a flower to study in the field, noting the leaves, buds, and blossoms. Advanced study: Sketch the flower parts in your nature journal from direct observation. Advanced study: Mark your hepatica plant in the woods so you can return and make summer and autumn observations. I suggest tying a string around the stem and noting in your nature journal where the plant is with a simple diagram or map. 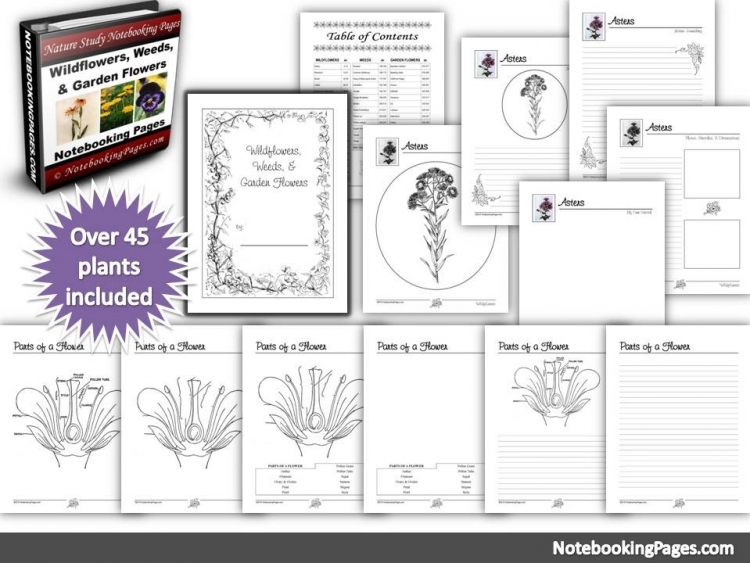 Create a nature journal entry for the hepatica. Use as much detail as you can showing the flower’s shape, color, and size. Note the habitat and the conditions in which the flower blooms. Note the date of the first flowers. Sketch the leaf. Advanced study: Compare the hepatica and the spring beauty (or other early spring wildflower) if you have both flowers in your area. You can find images of many early spring wildflowers on this page: Spring Wildflowers. If you want to purchase the Winter Nature Study Continues ebook so you can follow along with all the notebooking pages, coloring pages, and subject images, you can join the Ultimate or Journey Membership Levels. See the Join Us page for complete information. Also, you can view the Winter Nature Study Continues Ebook Announcement page for more details. Well… We didn’t find any hepaticas, but we did enjoy a nice (but hot) jaunt through the woods. I believe we missed the “early spring” part of the hepatica search for our part of the country. We still enjoyed reading about hepaticas and being out in nature together, so still a valuable experience. Thank you for posting a weekly challenge to keep us in the wild! We are just starting to get our normal “early spring” flowers right now in great numbers. The season is very different this ye3ar. Glad you were able to get out for a walk!